Google today outlined a number of changes to its various messaging services, including a dramatic shift for Hangouts. Starting May 22, Google Hangouts will no longer support SMS for text messaging between phones. Hangouts will continue to work as a messaging client, it just cannot be used to send SMS messages. Earlier this year Google said it plans to refocus Hangouts on enterprise communications. Google is now pushing the Android Messages app as its primary SMS client. The company is working with carriers to add RCS to the Android Messages, and Google expects to see the app become the default SMS tool on Android phones over time. RCS in Android Messages will support features like read receipts, group chat, hi-res photo sharing, and more. 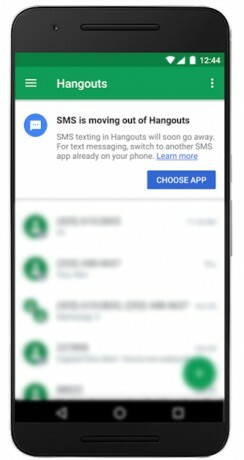 Google plans to notify Hangouts users about the change in the coming weeks and will recommend they download Android Messages. The shift to Android Messages will not impact Hangouts users' message history. More importantly, Google says Google Voice and Project Fi customers will continue to be able to use Hangouts for SMS for the foreseeable future. In other Google messaging news, Google said it plans to get rid of Google Talk within Gmail and replace it with Google Hangouts. It began doing this several years ago, but will finalize the transition in June. The legacy Google Talk Android app, which was replaced in 2013, will cease working when the transition takes place. All Google Talk users should expect to use Google Hangouts moving forward. Google is also retiring a number of Gmail Labs, including Authentication Icon, Google Voice Player, Picasa previews, Pictures in chat, Quick Links, Quote Selected Text, Smartlabels, and Yelp previews. Last, Google is removing some Google+ functionality from Gmail, specifically the ability to email Google+ profiles and the use of Google+ Circles. These changes will take place after April 24. Google this week updated its Hangouts app for Android devices and made a few performance tweaks along the way. Going forward, Google says it should be easier to find the right contacts quickly thanks to a reshuffled contacts user interface. Google has updated Hangouts on the web and on mobile devices with a new user interface for finding the newest messages. Moving forward, Hangouts users will see a "Jump to Last Read" button that will take them to the last unread message in their chat.